StrongVPN one of the oldest VPN providers in the industry has unveiled a completely redesigned service. The overhaul includes everything from their logo and website right through to their apps. If you’ve done your VPN research then you’ll know it’s almost impossible to avoid the name StrongVPN. The parent company behind the service began in 1995 and they’ve been providing online privacy services for as long as we can remember. If you’ve used the service in recent months then you’ll know both their software, apps and website have become dated. To rectify this, StrongVPN has in one clean sweep updated their entire service and it’s not just the visuals they’ve been concentrating on. The StrongVPN service has always been one of the more robust VPN services available allowing access to the likes of US Netflix when others were blocked. However, the software offered was one of the most outdated and unfriendly we’ve seen. 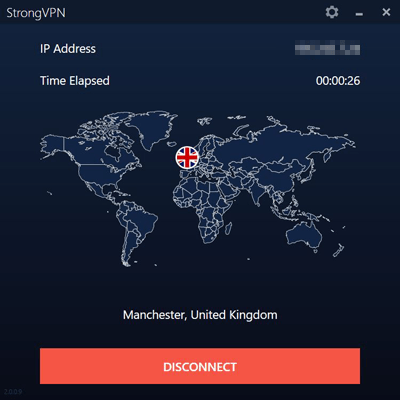 To put this right StrongVPN has released a range of new desktop software that is not only completely redesigned visually but also in functionality. Gone are the confusing selection of servers that need changing by protocol, instead a simplified country selection list is available allowing you to connect to over 26 countries across the world. Plus the ability to automatically connect to the best server for your location. The settings area is now neatly tucked away reserved for those who like to tinker with features and includes options such as a Kill Switch and the choice of no less than 4 different VPN protocols. Alongside the desktop updates, StrongVPN has also completely overhauled the mobile apps which offer the same uniform design as the desktop counterparts. The seamless design will make using StrongVPN across an entire range of devices easier and allow users to get connected without the need to deal with different layouts and a mix of confusing designs. While the apps which are the meat and bones of the service have had a much needed facelift the branding of the service has also undergone some cosmetic redesign too. Adoring a completely redesigned website is a new futuristic logo. The website is now much less cluttered which if you’re not a StrongVPN customer already allows you to pinpoint the areas of interest and research the available features of the VPN service more easily. StrongVPN’s Douglas Haden said, “Our primary goal for the new StrongVPN was to make privacy and security accessible for everyone” and with recent privacy breaches and an increased interest from general users interested in securing their online privacy, it appears the update has come at the right time. StrongVPN offers VPN servers in more than 26 countries across the world in over 40 different locations. Apps are available for Android and iOS mobile devices and Windows and Mac OS desktop or laptop computers. The service is available at a cost of $10 per month or $5.83 p/m when taking an annual subscription. Payment options include Paypal, Credit and Debit Card, Bitcoin and Alipay. Users can connect on 5 devices simultaneously with one account and there’s a 30-day money back guarantee. StrongVPN claims to store zero logs of your activity and if you get stuck there’s 24/7 support available. If you’re interested in taking a look at the newly redesigned StrongVPN service simply click the button below to visit their website. VyprVPN strike new markets with Middle Eastern and Indian servers.